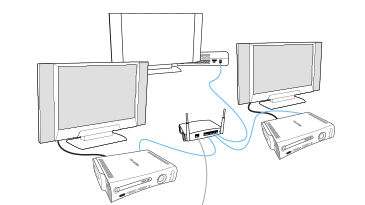 System link play is a form of multiplayer gaming that lets you connect two Xbox 360 consoles by using a cable or up to 16 consoles through a network. With linked consoles, multiple players can play the same game. This type of multiplayer gaming is different from split-screen multiplayer gaming, in which all the players are connected to the same console. This article describes how to link two or more Xbox 360 consoles together to play a single game from multiple consoles (system link play). Note You can include both original Xbox 360 and Xbox 360 S consoles in system link play. Tip Look on the back of the game box for the system link play icon and information. The game box or manual will tell you how many players can play a system link match for that game. A game disc of the same game for each console, with the same game version, maps and mission updates. Connect one system link cable or an Ethernet crossover cable to the Ethernet port on the back of each console, linking the two consoles together. 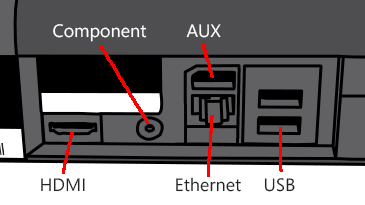 On the Xbox 360 E console, the Ethernet port is below the Aux port. 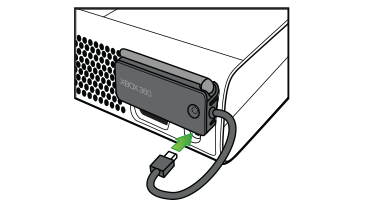 On the Xbox 360 S console, the Ethernet port is below the Aux port. 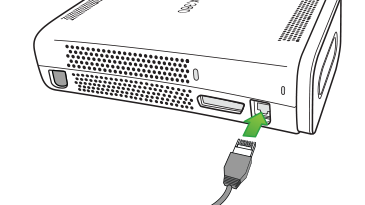 On the original Xbox 360 console, the Ethernet port is next to the A/V port. 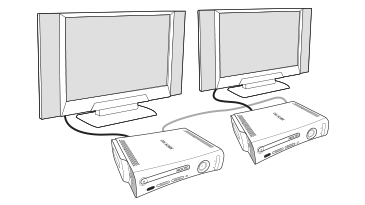 Connect each Xbox 360 console to a separate TV or monitor. Turn on both consoles, and follow the game instructions for system link game play. Note For system link play, both consoles must have the same game, game version, maps and mission updates. Connect each console to a separate TV or monitor. Connect each console to the networking device (hub, switch or router) by using Ethernet crossover cables. Turn on the networking device, and then turn on the consoles. Follow the game instructions to start system link play. You can connect two to four Xbox 360 consoles together for system link play by using Xbox 360 Wireless Networking Adapters or the built-in wireless networking in an Xbox 360 S or Xbox 360 E console. 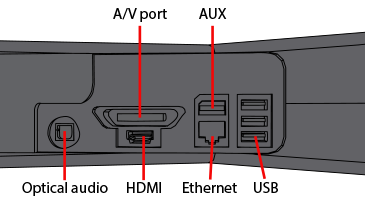 Each console's wireless networking adaptor communicates with the other adaptors. An Internet connection isn't necessary to create this type of link, and the console-to-console connection is typically temporary. Note You cannot mix wireless and wired connections in the same system link play configuration. Attach a wireless networking adaptor to each original Xbox 360 console, and make sure the adaptor is installed and set up. Note The Xbox 360 S and Xbox 360 E consoles have built-in wireless and do not require a wireless networking adapter. For information about installing a wireless networking adaptor, see Xbox 360 Wireless Network Connection Solution. Turn on all of the consoles. Go to the Settings and select System. From the Available Networks screen, select Advanced Settings. Enter the name you want to use for the wireless network, and then select Done. The wireless ad-hoc network has now been created. Each player can connect to this network from their console by selecting the wireless network name you created from the Available Network screen. Select Create Ad-Hoc Network, enter the name you want to use for the wireless network, and select Done. Each player can connect to this network by selecting Scan for Networks and then selecting the wireless network that you created. Would you like to contact Support regarding the "How to use system link to connect multiple Xbox 360 consoles" issue you were reading about or a different issue?